Cambridge UK, Wednesday, 14 March 2018 – Redgate, the Cambridge UK based software company which has become the biggest Microsoft SQL Server tools vendor, has seen its ongoing commitment to database development recognized in a major awards ceremony. 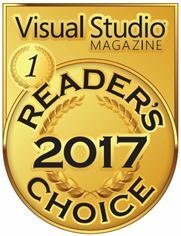 In the recent Visual Studio Magazine Reader’s Choice Awards, Redgate won gold, silver and bronze awards across five categories, building on its success in earlier years. Redgate’s SQL Toolbelt, which enables companies to introduce DevOps practices to their database development process, won gold in the Databases and Data Development and Modeling category for the second year running. SQL Prompt, which lets teams write, format, analyze, refactor and share SQL won a gold in the Productivity Tools category for the first time, reflecting the collaboration and teamwork that it brings to database development. Redgate’s ANTS Performance Profiler which boosts application performance won a silver in the Performance, Profiling and Debugging Tools category, after winning a bronze award in the same category in 2015 and 2016. And Redgate Readyroll, which enables users to develop and deploy databases in Visual Studio with migration scripts, won a bronze for the second year running in the DevOps category. This award in particular shows the growing desire to include database development in DevOps processes. The last award is also the most notable because while SQL Server and SQL Server Management Studio won gold and silver in the Most Highly Valued Data-Centric Development Tool category, there was a notable tie for bronze. Redgate SQL was a joint winner with Visual Studio and firmly cements Redgate’s position as the leading Microsoft vendor for SQL Server. The awards follow a memorable year for Redgate, which saw record growth, the inclusion of Redgate Data Tools in the installer of Visual Studio 2017, and the introduction of new tools to help users manage and monitor their SQL Server estates more effectively in order to comply with regulations like HIPAA, SOX, and the General Data Protection Regulation (GDPR). Redgate makes ingeniously simple software used by over 800,000 IT professionals and is the leading Microsoft SQL Server tools vendor. Redgate's philosophy is to design highly usable, reliable tools which elegantly solve the problems developers and DBAs face every day, and help them to adopt database DevOps. As a result, more than 100,000 companies use products in the Redgate SQL Toolbelt, including 91% of those in the Fortune 100.